We love to listen to our guests about what they like and what they don’t. We also make it a point to stay at Villa Capri in different rooms to see what our guests experience first hand. NEW - Outdoor Dining Table and Chairs. We loved our old trusty teak table but really it was the only thing that didn’t match our modern, light, look. So we headed over to our friends here on island Chaise Bay and they’ve got some GREAT stuff. NEW - Outdoor Shower. When you get home from the beach or out of the pool shower off with our new, modern outdoor shower! NEW - Landscaping. We took out many of the front hedges that just took too much water (which is precious here) and were somewhat dead most of the time. We replaced them with natural rock and some less water intensive planters to make you happy when you walk up to the villa. NEW - More Cover for the Pergola. We have lovely couches and chairs for you to relax on and enjoy the unimaginable colors of Chalk Sound but they get a lot of sun. So we put up 1” wood every 3 inches so you get some cover from the warm sun during the day. Come spend some time with your family, friends or both at Villa Capri. You’ll have memories forever! Since we've replaced almost all of the inside furnishings, outside furnishings, hurricane damage we thought it was about time to redo a photoshoot. We hired the awesome folks at Brilliant Studios to do an amazing job and they delivered! David Gallardo is just an awesome photographer and also uses a high-powered drone as well as underwater camera to capture the essence of the villa. 6 Brand New 5 Star Reviews for Villa Capri! We're pretty excited that our guests are loving Villa Capri. After all we've put a lot of hard work and LOVE into our villa. 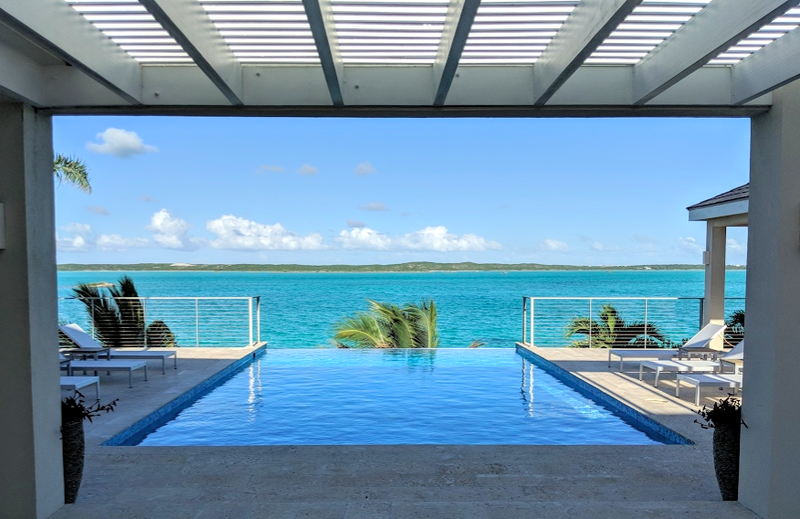 "Amazing villa, pictures do not do it justice, fantastic location, beautiful views of Chalk Sound." "We walked in to find a gorgeous bowl of fresh fruit and a few local beers, sodas, and waters in the fridge! The sound system was great, and we played music all week." "The owners have thought of every detail. And what a fantastic team they have working with them." "We snorkeled right off our platform and saw crabs, fish, and lobsters." " We loved the property, Chalk Sound, and the owners and will visit again when possible. This trip will be one of the favorites that I look back on. Thank you!" But read them all for yourself! We were SO happy to get back to what we love to do; accept guests to one of our favorite places on Earth, Villa Capri! Our first guest arrived and check out what Kathy had to say in her 5 STAR REVIEW! Eight of us rented this property to celebrate a 50th birthday and it was perfect. The layout of the house is such so that each room has its own bathroom in the corners of the house and that afforded everyone their own area of the house for privacy. The common areas of the kitchen and living room were large and didn't feel crowded when we all gathered together to cook when it was too rainy outside to grill. But, even when it rained and we wanted to be outside, we all sat around the large table outside the kitchen which was perfect to still enjoy the beauty of Chalk Bay and not feel cooped up due to weather. I loved walking out by the pool and finding each one of my friends spread out around the property reading books or listening to music and getting their quiet time each morning. We never felt crowded. Another highlight for me was having a yoga instructor teach yoga to four of us by the pool with a view of the bay in front of us. Completely relaxing. The owners seem to have thought of everything. The house is on a quiet road further away from traffic and other businesses, which was a bonus for us, but we hardly wanted or needed to leave. The kayaks, paddle boards, masks and snorkels, and pool toys kept all of us entertained and we enjoyed being able to play in the Sound without having to go rent equipment. 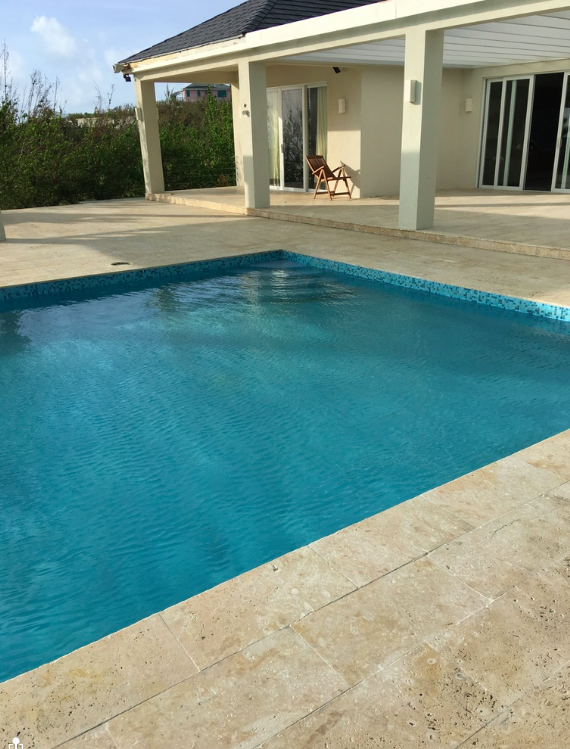 Our original villa was damaged due to Hurricane Irma and Janine was so communicative and helpful in the weeks leading up to our visit, we were able to relax and trust that everything would be exactly as pictured when we arrived and it was. 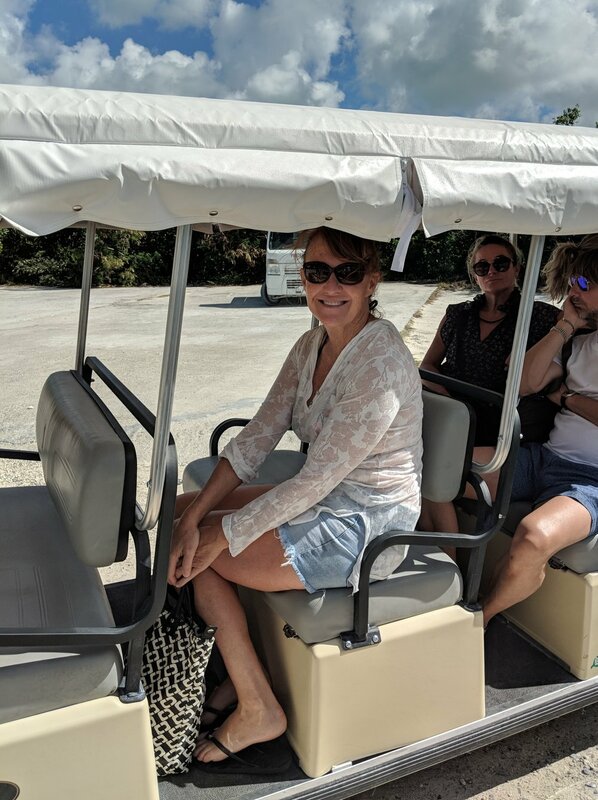 We loved the property, Chalk Sound, and the owners and will visit again when possible. This trip will be one of the favorites that I look back on. Thank you!" Kathy T.
Kathy we can't thank you and your friends enough for this review! We just had our second guests arrive and leave, hopefully with the same sentiment. Our third guests arrive tomorrow then we get to go back and stay for a week...we cannot wait! Great question! As you may recall we installed temporary wooden (beautiful) railings. Our new cable railings have made it to the island but we've had awesome guests staying there so we have not been able to install them. We'll be doing that in a week or two. We'll also be installing an outdoor shower and putting a frame around the outdoor TV to protect it but also it will just look cooler. And that's about it! So we'll keep blogging here but we probably won't be bugging you in email so much. It’s really amazing to see the island coming together, whether it’s repairs to schools & churches, small businesses or the resorts. Everyone is rushing to complete their repairs, and in many cases improvements, in time for peak tourist season. All of this is helping get the economy back in gear and families functioning again! As you know our second big materials delivery was for 125 more pieces of plywood and 100 rolls of ‘peel & stick’ an adhesive roofing material that applies over the plywood to create a watertight seal. 100 rolls of this compared to a grand total of 625 pieces of plywood may sound a little out of whack, but 100 rolls covers almost 20,000 square feet and 625 pieces of 4’ x 8’ plywood covers about 20,000 square feet too. The distribution is underway, we actually drove past a truck hauling a bunch of materials on Tuesday, and it happened to be THE actual truck that was transporting some of the plywood and peel & stick you donated to several schools here. Sometimes it takes a week or so to get info back on exactly which schools and churches received the materials, but we know for sure that the Example of Christ Ministry, the Rock of Jesus Ministry and the Community Fellowship Ministry & School were among the grateful recipients. When we get more pictures we'll share them with you. We thank you so much for your donations, it has really helped the great people of Turks and Caicos. Oh yeah, we're inching closer to our goal of $35,000! We’re at $32,150 now. Big thanks to all of you, to Island Bargains for getting the shipments in for us and thanks to Captain Miller and the TCI Salvation Army for making sure it went to the right places! Guests Have Arrived at Villa Capri! We are pleased to announce that after months of work Villa Capri is open for business! A huge thanks goes to our amazing GC Princie, our awesome 'Mr. Fixit' Ednel and his team, and our brilliant property managers Dinesh, Faye and team at Island Escapes. Everyone worked hard to get us back to normal so thanks to everyone. Oh yeah, John got a shard of glass in his eye while cleaning and is still feeling it weeks later. Sorry Johnny! Remember, the outdoor railings are temporary and they still look awesome! 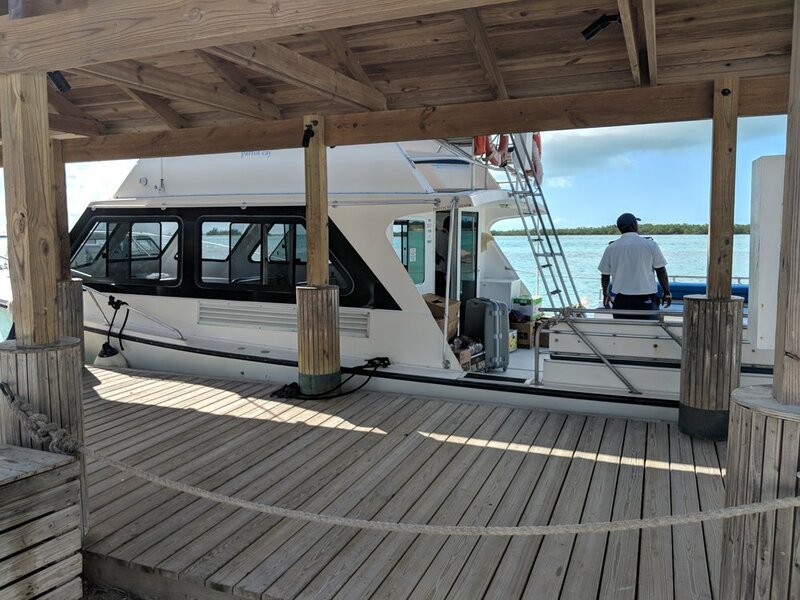 Snazzy new cable railings reached the boat this past Monday to arrive this coming week. The challenge will be finding a time to install when we don't have guests! These pictures are the latest and greatest of the indoor furniture replacement, ceiling fan and indoor lighting fixture so they don't look like the pictures on this website. We were just talking to our photographer about updating the pictures since we've done so much...but Irma paid us a visit. So here you get to see the new, even more modern, look. In a SHORT 46 days we did this! Plus, raised $32,000 for rebuild efforts in Turks and Caicos, bought and shipped plywood and roofing materials to the island! Speaking of our GoFundMe efforts, the next shipment of plywood hit the island this week! We bought 125 more sheets of plywood on top of the 500 sheets you allowed us to purchase already PLUS we bought 100 rolls of Peel and Seal which is the water-proof membrane that goes on top of the plywood. In the event that someone can't put shingles on their roof, this stuff would be enough to stop water from coming in. By the way, 100 rolls of Peel and Seal = 19,500 FEET of roofing material. This is awesome, thank you all for your generosity, you're helping to get people back in their homes, back to work, school and boosting the economy! On top of all of this, we did a quick trip to San Francisco last week to finally get our belongings out of storage and onto a truck to get to a boat in Florida to get to our final destination: Turks and Caicos! As we were there we got to see a BUNCH of lifelong friends, we miss you, come visit! There's been a lot of action this week at Villa Capri preparing for the busy season beginning November. We're excited to have our first post hurricane guests on November 11! 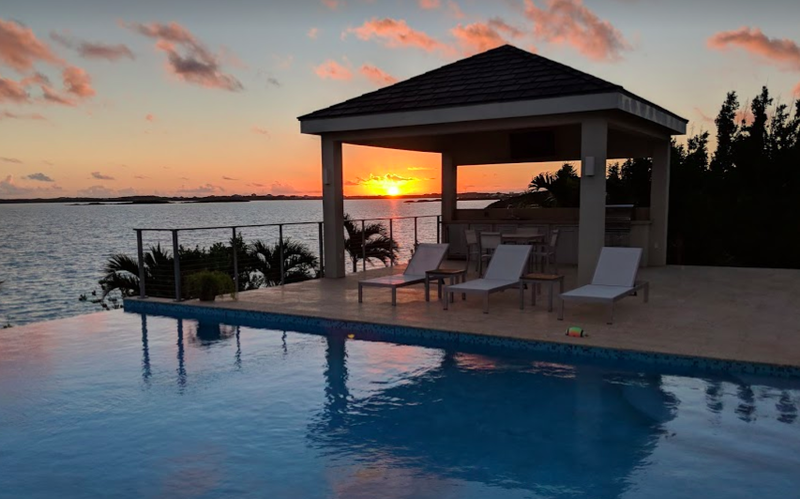 In the meantime, we will be moving into a small condo on Grace Bay so that when you are enjoying Villa Capri, we actually have a place to live. I'm writing this post on the plane to San Francisco, our previous home, where we'll be collecting our belongings, putting them on a truck and getting them on a boat to our new home. Happy! Tore out most of the molding to prepare for new tile molding, will be done by Wednesday. Tiles for the molding arrived by boat this week and are being cut around the side of the villa. All outdoor lights have arrived and are waiting replacement. John did an awesome job on lounge clean up duty! The bottom of the old barstools took some rust damage, so here's to Kartell plastic. Johnny with our brand-spanking new railings thanks to Princie our contractor! On a side note, our GoFundMe page has done the TCI proud! The second and final shipment of 125 pieces of plywood and 100 rolls of peel and stick roofing material were ordered and are on a boat from Florida to arrive here hopefully in the next few weeks. We'll be working with our local friends to help distribute. Thank you to all who donated, every $20 helps!! What an awesome Monday! 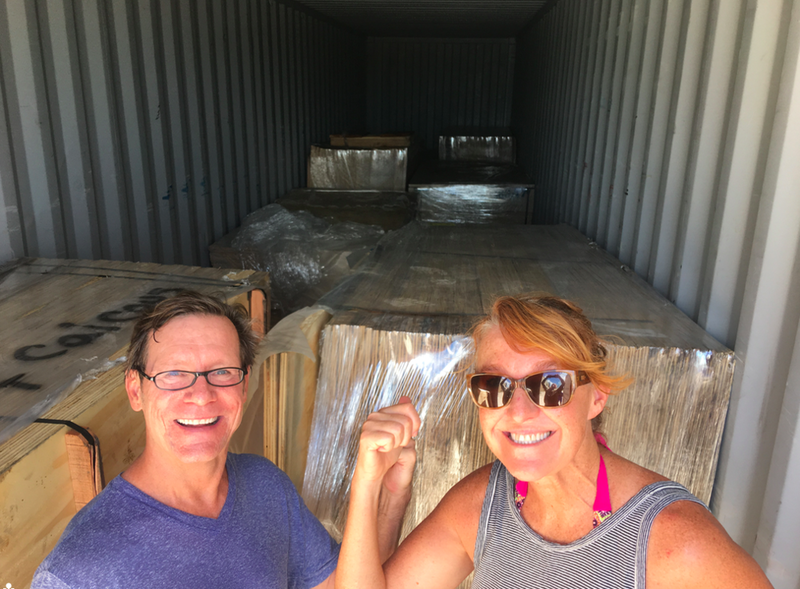 Finally, our 500 sheets of plywood, 4' x 8' x 5/8" to be exact, cleared customs and was delivered to a warehouse not far from where we're staying in Grace Bay. What a sight, the shipment took up an entire shipping container of its own. One pallet, about 62 sheets, couldn't fit so remained at our shipping partners Island Bargains’ warehouse. This worked out great, as we had earmarked about that many sheets for some local folks we had identified as in need of roofing material. So within about an hour of us notifying them they started to arrive at Island Bargains to load up. As that was happening, we met with a couple of very kind & knowledgeable people, Mark Franz from Mission of Hope and John Lawson from Island Bargains, over at the container to discuss the logistics of distributing the stock. They are very involved in charitable giving on the island, and have ‘feet on the street’ to know how to ensure goods support the right people and causes. And, as we’d quickly learned, navigating the politics of charity work is tough! Long story short, we want to make sure our goods don’t get caught up in making any particular political figure look good at the expense of really needy people and organizations. So, first was the 2 pallets we earmarked for a small island called Salt Cay. Due to their size, they just don't get much representation, so we felt strongly about supporting them. And fortunately, a long time friend of ours, Travis and his co-worker Jose came over and offloaded the sheets from the container to a truck, which will deliver it to a barge to Salt Cay. After discussing with Mark & John we decided the balance, about 300 sheets, will be used to help schools and churches rebuild. We couldn’t think of a better use. Later this week, we’re going to meet with Mark, John and a couple others to decide on the next shipment, likely a combination of more plywood and peel & stick, an easy to apply waterproof roofing material that goes on top of plywood. Plus we’re planning to use a portion of the remaining funds to support an awesome program here called Back To Work, more on all that soon! Thanks everyone who supported our GoFundMe page that allowed the donation of this plywood to help rebuild Turks & Caicos! As we mentioned, we upped the goal to $35,000 so please share with your friends! Travis (right) and Jose manhandle the plywood, 2-3 sheets at a time! Travis got it to a warehouse where it will be shipped to Salt Cay! Glass Cleanup, New Windows, Off the Rails! We've said it before and we'll say it again..."No more glass railings!". We've now gone over the patio twice with a shiny new Shop Vac. Why? Bits of glass from 95' of railings can put a hurt to your house and cracks and crevices in coral stone. The coral stone is beautiful tile but man can it hold bits of glass! Johnny works a mean Shop Vac on the patio! The glass also got into the landscaping and the stones on the grounds, if you didn't know it you would think we meant to have it there glistening in the sun! I went out by hand to gather some up! Our window and door glass started installation yesterday...all sliding doors have been installed! Beating a dead horse...no more glass railings. They wreaked havoc on our windows! Now for the new windows...never thought we'd be so happy about GLASS! Brand spanking new unbroken glass in the bedroom sliders! Our contractor Princie started with the temporary railings yesterday! We will have these in place for our guests until our new alumimum and stainless steel cable railings are fabricated and shipped. Gotta love Chalk Sound, one of the BEST places in the TCI! Finally, we got one of the last parking spaces at Graceway market last night to buy some salmon for dinner...did it have to be next to the "other" yellow Mini Cooper on the island? John is writing the post on the update for the donation efforts from our GoFundMe page. Yesterday was not only an epic day for Villa Capri, but also for literally getting roofs over Islander's heads! Schools have opened, if you are planning to come here check out Beaches Program Pack for a Purpose. You can stick school supplies in your suitcase and bring them to Beaches Resort where they will be distributed to schools! Our plywood has CLEARED CUSTOMS! This means we'll be able to distribute it this week to much needed families, we will take pix and share. In addition we bought 90 tarps, a thousand plastic ties, 400 towels and will be dropping it off to a distribution center this week. The Mini packs a donation punch! We've spent $16,873 of the $26,750 raised so far. We wanted to make sure the plywood made it to island and cleared before our next big purchase which we think might be Peel and Seal to cover the plywood. If you have donated a big THANK YOU. We went over to the villa yesterday to find that we had....POWER!! Oh the excitement of turning on ceiling fans and air conditioning. It was too much to handle. Princie our awesome contractor bought a shiny brand new Shop Vac for me to...vacuum glass bits, and it works like a charm. I got about 2000 sq. feet done yesterday, more today. He also started to work on dismantling what was left of our railings, and he's purchased wood for our temporary railings that will go up beginning next week. One thing, because of the hurricane and everyone needing to be ready for vacation season at the same time, it's nearly impossible to find someone who isn't already taken by a big resort. And we have not only Princie, but our folks at Island Escapes who will also help us out getting ready. The glass guy came out for his final measuring and cut of glass which will begin Monday. Our amazing property management company Island Escapes dropped off a HUGE palette of stuff to the villa. We were able to get into the country DUTY FREE, a generator, portable AC, lanterns, batteries, new outdoor refrigerator (Irma was rude to the one we had), replacement outdoor lights, and towels lots of them, (many used to clean water after Irma). Thanks guys!! On a side note, the government has NOT cleared our plywood through customs yet from the generous GoFundMe page many of you have contributed to. It's sitting in a warehouse waiting to have some higher power "bless" it through. More on it as we know where the h it is. We did get 90 tarps cleared through yesterday so we'll distribute those this week! Because it's rained here a few times they are MUCH needed. We were out at the house cleaning glass with our friends at Tropical Waves. They took up most of the glass railings that shattered and it looks great. I swept glass off of the patio for hours but it's starting to take shape. John cleaned the ladder that goes down to Chalk Sound, mostly so we could get in and out of the water! It's great! We're back in and out of the gorgeous Chalk Sound! We cleaned and reinstalled our stainless steel drawers outside that were blown all over the patio during the hurricane. The grill has been installed as well. A few dents but it looks pretty good! We've been staying in the Grace Bay area until our power comes back on. The Chalk Sound area is notoriously one of the last areas to get power and unfortunately one of the worst hit by the eye of the storm proximity. Good news is that Fortis our energy company is in Chalk Sound replacing poles now. Because we've been staying in the heart of the tourist area we've been able to really keep a finger on the pulse of how fast things are moving and they are moving fast! Everyone who lives here knows that this country survives and thrives from tourists so we are working on getting this country up and running. That said even more restaurants and shops are opening every day. New openings include Seven Stars and its restaurants are open, Yoshi's sushi, Grace Bay Club and Infinity Bar, Simone's, Fresh Catch, Via Veneto, Lupo and Shark Bite get added to the list. Schools have started to reopen, we just saw our friends Jean and Jhenny and their little girl had her school uni on! Railings are in drawing phase almost ready to get made! These railings will hold up to wind (they're not glass) and rust (they're aluminum)! Thanks to Keuka Studios for doing this so fast. Our new NON GLASS railings! The pool is now filled and we're awaiting replacement for the glass windows and sliding doors. We think we may have found some on island to be installed quickly, fingers crossed. Those two things are the biggest for us. And at last our new "bar stools" were delivered. Epic #fail on who I ordered them from, turns out they're actually dining chairs! Off to the internet we go to replace these, it ain't so easy returning items that were mis-delivered. The other day, we were warned of miles-long lines at the Do It Center (our version of Home Depot). However when we got there, there were no lines! We think it was due to the fact that Friday was a national holiday. Before we went on our little shopping spree (light bulbs, rags, WD-40, fun stuff like that!) we spent lunch with our buddy Benchley at Mango Reef in Turtle Cove. When you come or if you've been there you love it. And it's in full swing. We knew we had to clean up glass around the yard because our glass railings shattered. We'll be cleaning it up for months probably, but we got a lot of it removed1 We also focused on de-rusting our table and chair legs in the dining room. 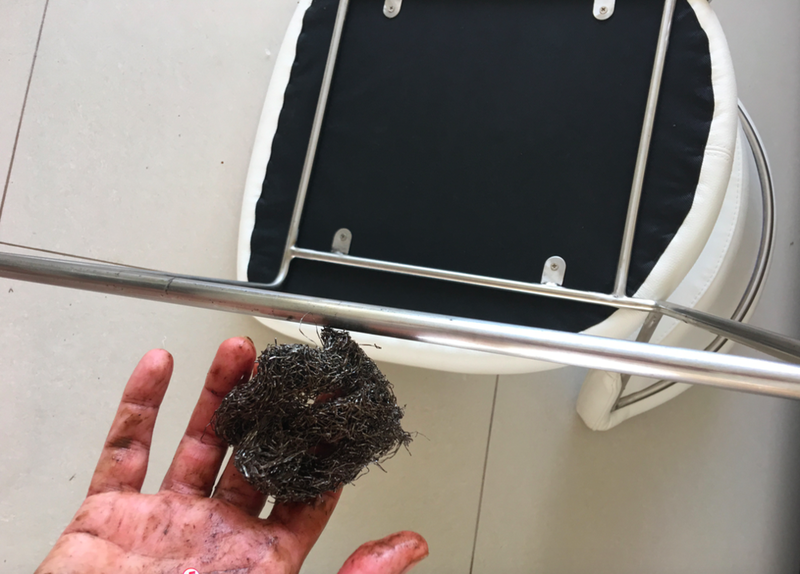 Lesson learned, no more metal furniture! But WD-40 and some good steel wool and we're back in business! We also took advantage of the pool being empty to replace some of the little glass tiles that always happen to pop off over time. And taking stock of some other little improvement we want to make, like new rope on the fences and new ideas for landscaping. Little things, but they all add up! Another restaurant opened on Friday, Infiniti at the Grace Bay Club. This is great news as the island continues to rebuild. We got news that our closest and one of our favorite restaurants will open on Monday...Las Brisas! We'll be stopping by there on our way to Villa Capri. If you have ever been to Villa Capri or are planning to come, you will go to this place, it's our neighborhood joint. And last but not least, with the enormous generosity of our friends who donated to our GoFundMe page we hit our initial $25,000 goal. So in addition to buying all that plywood and planning the logistics for distribution, we did raise it to $35,000! That means we could bring more plywood in, which is in huge demand. Even a few sheets can really help each person. Thank you and please share with your friends. Well John and I are heading to our version of Home Depot today (Do It Center) to pick up some cleanup tools for Villa Capri. Meanwhile amazing people are doing amazing things on island. We'll have more updates for you about who we're working with early next week, but more supplies are being flown in the help rebuild (this morning a plane for South Caicos who got hit hard by Maria!) and a huge cleanup effort this morning on 3 parts of the island. We just found out Fortis, our electric company has MADE IT TO CHALK SOUND! That's great news and FAST. Our 500 sheets of plywood made it on the boat yesterday so we're hoping it arrives by Monday. Thanks for all who donated on our GoFundMe page, please share with your friends, we're going to buy another few hundred sheets this weekend! "Come back to Turks & Caicos; come enjoy our lifestyle, our people, and our hospitality, which the world has grown to love. We are open to serve you. 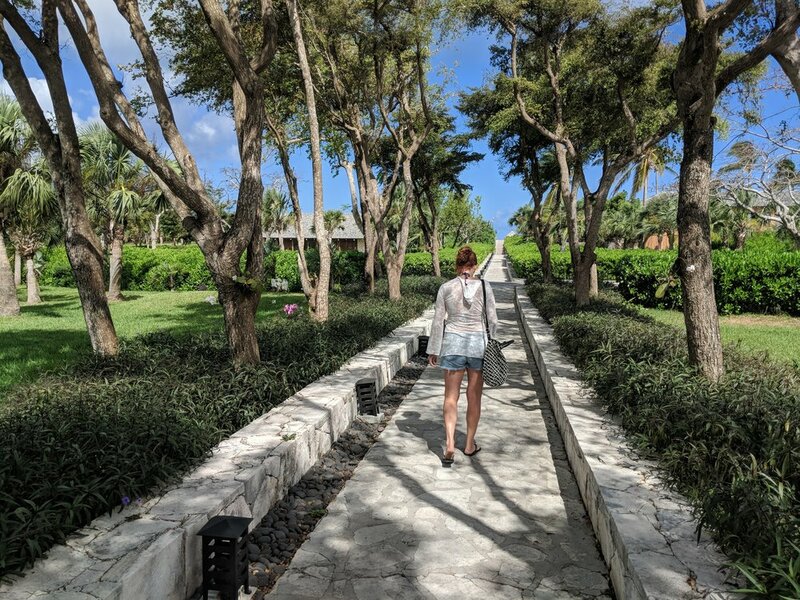 The Turks & Caicos Islands that the world has grown to love is still here for you to come and enjoy--our casual luxe lifestyle, our friendly people, and our warm hospitality are all waiting for you! Hurricanes Irma and Maria did not break us, they did not steal our ability to love and serve. These storms only exposed some of our vulnerabilities which we must strengthen. While the vast majority of our tourism infrastructure sustained minimal damages, several of our communities received direct hits from Irma. Indeed, this will cause some hardship over the short and medium term; however, we have persevered and came through with high spirits. Our government rededicates itself to the rebuilding process on a steady path of completion in the near future. 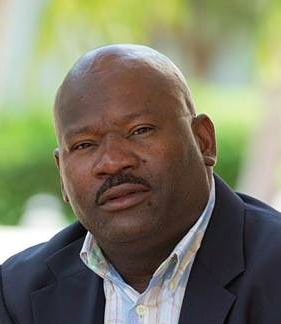 The Turks & Caicos Islands have adapted with resilience. Our ability to foster partnerships with key agencies, locally and internationally, will accelerate the process of recovery. We continue to remain optimistically confident that we will be able to return to providing the quality and excellent service that our islands are known for. Our tourism product will continue to evolve from the experiences we have undergone, affording us the opportunity to be more creative and innovative with the goods and services we offer. Hoteliers are on schedule with their repairs and annual off-season maintenance schedules in preparation for re-opening, and have demonstrated their support for the welfare of their workers and the greater community as a whole. 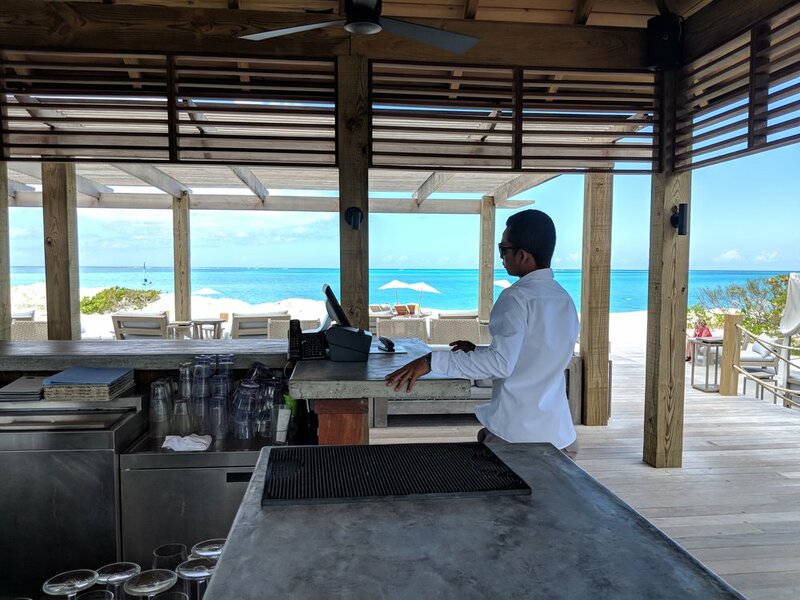 “Irma and Maria have provided some challenging circumstances, but circumstances that present us with opportunities to forge new relationships and strengthen existing ones,” commented Nikheel Advani, President of Turks and Caicos Hotel & Tourism Association. “We are here to serve, and serve we will”. Most international flights have resumed normal operations as at Saturday, September 23rd. The majority of the country’s utilities services are back on line, and the workers are feverishly addressing those pending. As Minister of Tourism, I would like to encourage you to include Turks & Caicos Islands in your vacation plans right away. I can assure you that the warm hospitality which our islands have become synonymous with, will embrace you. You will also get some pleasure from knowing that while you are vacationing with us, you are helping us to rebuild our islands and returning normal lives to our people. Hon. Ralph L. Higgs Minister of Tourism, Environment, Gaming, Culture and Heritage Turks & Caicos Islands Government"
Well we went over to Villa Capri for the first time yesterday afternoon. We had huge lumps in our throats as we drove through Chalk Sound. I have to say there were houses that didn't look like much was touched (although all houses had some form of damage) and others that were ravaged. There was no rhyme or reason to it all except for from what we could tell, the ravaged houses may not have been built with solid concrete. Fortis, our electric company, started to get down South Dock road, which is the main road many of you have taken to get to our villa on Chalk Sound. That said, there are still poles down on Chalk Sound. There are rumors that the entire island will have power by mid October, which is amazing. Fingers crossed that actually happens. You would think that having the current Deputy Premier and Ex Premier of our country living on our road would have some pull, but in fact it seems the electric company is trying to get electricity to the masses first, which is awesome:-) And I have to tell you, the Fortis guys work HARD. Bravo. 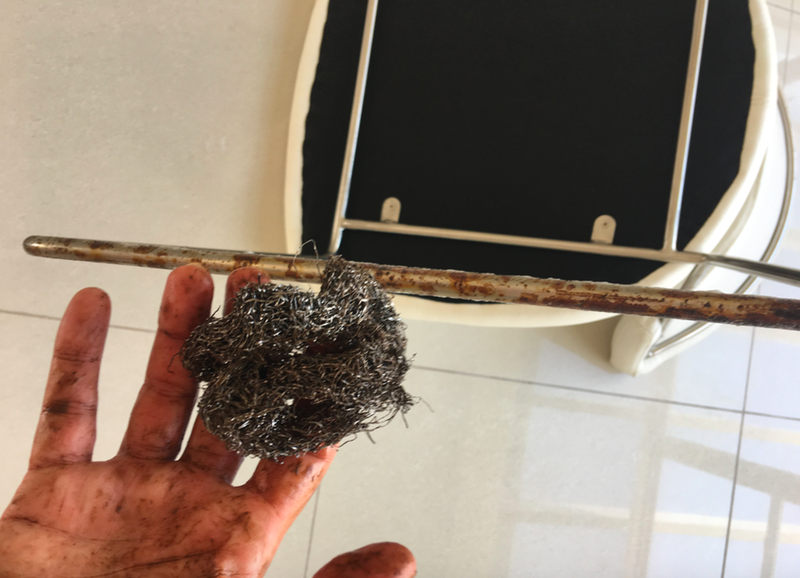 We had 95 feet of glass railing around the pool and terrace completely SHATTER! All but 3 panels, again no rhyme or reason why those three survived and the others didn't. The glass cleanup is tedious, and we'll know more tomorrow as that's what we'll be doing. Island Escapes our property managers and their team really have been awesome helping out on that, other repairs and even meeting with our insurance adjusters. By the way, if you have not stayed at the villa, you will meet our property managers on arrival (Faye, Dinesh or Julian!) and you'll really see how amazing they are. They're working on our villa like crazy but they also have dozens of others they need to cleanup as well. Thanks guys. We're upgrading the railings to a really slick-looking cable railing system, NO MORE GLASS! Our friends at Tropical Waves Water Sports have also pitched in to help in the landscaping & glass cleanup. 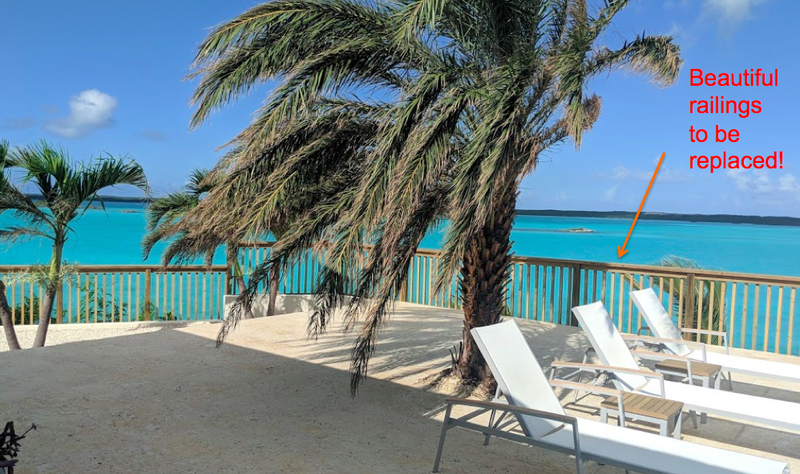 When you get here you'll visit them, they've got jet skis, tubing, paddle boards and kayaks to rent at our fave beach Sapodilla Bay Beach. 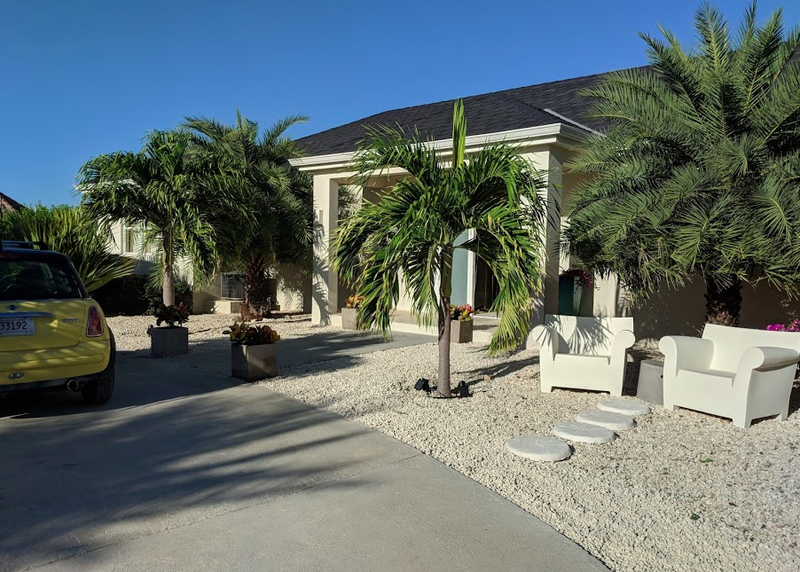 We're meeting with a window and door distributor this week, we are upgrading our sliders and windows that lead out to the patio and pool and will highlight the fantastic color of Chalk Sound. Ednil our CRO and team working hard on Villa Capri to get ready for the season! Our pool has been emptied, cleaned of glass and will be refilled as soon as possible. Again Island Escapes to the rescue and our good friend Ednil who is our CRO (Chief Repair Operator) is on it! I think that the biggest thing for us is what we can see...as our friend and neighbor Elen said "I'm seeing things I've never seen before." due to the wind burnt bushes and shrubs, But in no time it's coming back! Bougainvillea along the house already coming back after just 8 days! Anywhere where we can use this as an opportunity to make improvements we are, it's not just a cosmetic cover up. On a final note, we talked to a lot of people in the past day. The woman at immigration said that by November, things will be back to normal. The woman who shouts at people outside the airport for parking too long said that it's starting to pick up and she couldn't be happier about it. Our friend at one of our favorite restaurants said it was really, really bad when it was happening but the aftermath could have been way worse. P.S. Because of the generosity of our friends who donated to our GoFundMe page were were able to secure and order 500 pieces of roofing plywood to be shipped here to TCI. It could help cover 100-200 homes. We increased our goal of $25,000 (which we reached today!) to $35,000 because why not help where we can. So we've used $11,000 so far and are on to make other donations. Thank you and please share with your friends.